Alright, look Warner Brothers — you don’t like me, but I really like you (can’t wait for the new Batman by the way) so I’m gonna try and help you out with this Dark Shadows thing. Working with Tim Burton can’t be easy. Sure, his last project made in excess of a billion dollars and became the 10th highest grossing movie of all time, and he can generally be relied upon to deliver a marketable product with a family-friendly MPAA rating (he’s only made one R-rated movie in the last decade), but once he gets an idea into his head, he cannot be stopped. So if he wants to make a black-and-white, Winona-Ryder-starring, stop-motion animation about a reanimated dog, Disney haven’t got much choice in the matter. And if he comes to you asking for $105 million to adapt a mostly forgotten 1960s soap opera for modern audiences, what are you supposed to say? ‘No’? So you greenlight, cast and shoot the movie, and so far everything’s looking good. 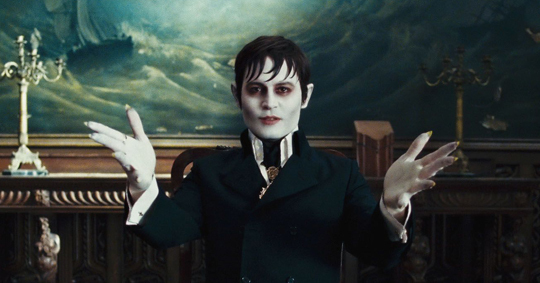 Johnny Depp’s great as Barnabas Collins, the fish-out-of-water 18th Century vampire who awakens in 1972. An ensemble cast including Michelle Pfeiffer, Jonny Lee Miller and Eva Green all suit their respective roles to a tee. It even looks nice, with Amelie cinematographer Bruno Delbonnel offsetting Burton’s signature gothic palette with some much-needed blues and reds. And screenwriter Seth Grahame-Smith’s campy soap-opera-style twists are simply to die for. But there’s a problem. The reviews start coming in. They’re bad. They call the film ‘unfocused’, ‘incoherent’ and ‘a desecration’. You start to realise that they might be right — in its devotion to the original show and its evident love of the soap opera form, Dark Shadows makes almost no attempt to reward cinema audiences. Its Darkplace-style narrative complexities are simply too offbeat for a film with such mainstream ambitions. But don’t worry — we can save this. With minimal reshoots and a small cash injection (I’m thinking $25 million if we drop the effects-heavy scenes and Depp takes a pay cut), Tim Burton’s Dark Shadows can easily become the greatest 12-part television series of the 21st Century. Imagine it: an all-star cast, directed by Tim Burton, camping it up in a shamelessly melodramatic, perversely high-budget, relentlessly unpredictable soap opera extravaganza. The blogosphere will have a field day. It’ll be like that time James Franco appeared on General Hospital. Times a million. And with the runtime cut down to 30 minutes apiece, those pesky complaints about structure and narrative coherence will simply float away. I know part of you probably just wants to make your money back, write the film off to experience and move on, but remember: complacency is the greatest enemy of success. Take the things that Dark Shadows has going for it, and build on them, rather than simply slapping them across the poster in the hope that they’ll make the film’s failings go away. Remember: Eva Green’s breasts will only get you so far. ONLY SO FAR. So call me. Let’s make this happen.